Curiosity's rear right wheel was tested to check the steering ahead of the rover's first drive on Mars. The Mars rover Curiosity is about to take its first test drive. It's kind of like getting a rover learner's permit. The science team is sending up commands to Curiosity telling the six-wheeled rover to drive forward, turn and back up. Mission manager Mike Watkins says the entire maneuver should take about 30 minutes. Watkins says we will, "definitely see tracks and definitely see it move." In all, Curiosity will move about 10 feet. This is a major event. Nearly the entire two-year mission hinges of Curiosity's ability to drive to rocks or terrain of interest, gather samples and analyze them. It would be considered a major failure if for some reason Curiosity can't move. NASA will hold a news conference after the drive to discuss how it went. A successful test drive will set the stage for Curiosity to head out likely by the weekend on its first real traverse of the Martian landscape. Several other tests have already been successfully completed. Watkins says, "We continue to hit home runs here." The arm with the hammer drill attached has been "stretched" to put in NASA terms. 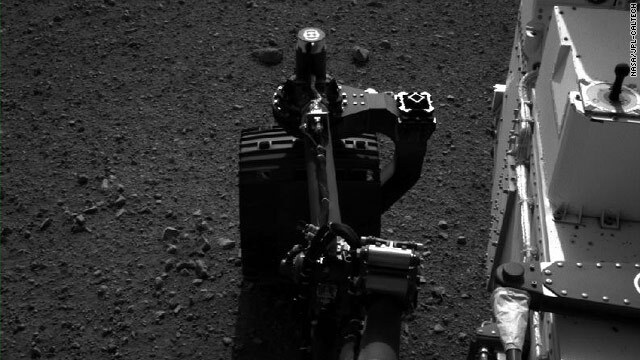 The team also told Curiosity to wiggle its right rear wheel. It did. So far, throughout all of the testing of Curiosity's system, the science and engineering teams say they've only found one problem. A wind sensor on Curiosity's Mars Weather Station has sustained permanent damage. The science team believes wires on the sensor are broken. The scientists say they may never know what caused the damage. One possibility is that small rocks hit the circuit board on the wind sensor. The rocks may have been lofted into the air by wash created from the rocket motors during the rover's descent to the planet. Deputy Project Manager Ashwin Vasavada says, "It degrades our ability to detect wind speeds from certain directions." Vasavada added there are ways to work around it. The microwave oven with a lot of trials from the beginning came up with one that outstands beyond expectations. The creation of the microwave propped up without intent. Incidental in its start, it had soared its way to global popularity because of a series of iterative regressions, discarding previous trials in production stages; bridging towards the latest usage-input, durability, and design.""".. To answer the orinigal post. It is easy to find even greater discounting (not haircut or fun) when looking at the orinigal asking price of new homes vs actual sale price. As a matter of fact, you can find homes discounted by millions of dollars, now below actual replacement cost. Selling homes below physical replacement cost is a great indicator that inventory is out of control and, perhaps, that we are overshooting the correction.Question: What's worse', 50% discount on a $2.9million or $220k home? I would like to see pictures of the horizon so can see just how much oxygen in mars air. There are plenty of pictures showing the horizon, but I don't see how you'll be able to get an oxygen determination from such an image. You will see a thin crest around the planet horizon similar to a Rain bow. Oxygen is an invisible gas. You can't see it here on Earth or anywhere else in the Universe. There are photos already available that show the "horizon" from Curiosity's viewpoint, but keep in mind that Curiosity sits inside Gale Crater. The top of the crater's walls are Curiosity's "horizon" and that would be a much shorter distance away than if Curiosity sat outside of the crater. It's been parked there for a week and there's no parking boot on it? Glad to see the Martians are liberal with parking. The Mars people who pushed this thing are all associated with Caral Sagan. Caral Sagan behind your name = money 🙂 Politics as usual. Just like how the defense department gets money, drum up issues and freak the people out. It is all a money game............and there is not as much to go around so people at NASA are no so happy. But I think it is better to spend money on innovation rather then killing people don't you? There is a reason why the Rover has not yet travelled around. There are issues with it moving, that is why they added in the article that if the vehicle fails to travel then the misson is a failure. But I have no doubt, that with Curiosity's near miraculous and complicated landing, and virtually ALL instruments aboard having been tested out as working, that there will be no difficulty at all in its ability to drive across the surface. Muslims believe that the first Koran is located somewhere on Mars. I love it when they say, "We may never know what happed to the windsensor." Well gee....unless you can get the Maytag repairman to pay a visit, then nope. @Jay, STFU and dont open anymore links about this mission then. Actually, Mr Trooper.....I think Jay's got a point. Jay, it's a good thing that NASA scientists have far more patience than you do. How much are you going to complain when Curiosity takes the better part of a YEAR to reach the base of Mount Sharp before it starts its epic climb up the mountainside? I guess when you have a $2.6 billion car, you drive even more slowly and carefully than an old person in a new Lincoln town car on I-95. This is great but I thought they were already cruising around ? Imagine the amount of money NASA could make renting out time to 'drive the Mars rover'. They could rent time out by the minute and have an experienced operator there to over see everything. It wouldn't even need to be really controlled by them. NASA could lie to them and take their money and nobody would be able to tell the difference since there are no independent eyes on the thing. Dust particulate has already damaged one of the wind sensors. Unless someone is paying $2 billion for that minute of driving time, it's definitely not worth the risk of permanently kicking a rock up into a wheel, or the camera, or (God forbid) the antenna with Earth. I'm pretty sure the rover has a very carefully calculated "flight path" laid out before it, with stops planned down to the centimeter to take readings and conduct experiments. Ohhh. Wiggling on Mars. GIVE ME BACK MY TAX MONEY! Yes, take that tax money and buy more bibles and flowers for your cousin. Where would you like your share – ~$8 – sent? $16. Only half of us pay taxes. The other half just. . .well, I don't know what they do all day? I think this is a great investment. If the 90 day rovers are any indication. They lasted for years. This two year probe should last 10 or more. Apparently Curiosity's power supply should be good for at least 14 years. Why can't "professional writers" use "its" and "it's" correctly? How hard is it? The writers/editors also tried to claim this is like getting a learner's permit. This is nothing like a learner's permit; the people on Earth who are controlling Curiosity are already as licensed/authorized to do so as they're ever going to get and are presumably well trained on the interface, and Curiosity's controls were inevitably thoroughly tested long before it was launched into space. The trillions of dollars spent on the space program has led to magnificent scientific progress. We now have Tang and microwave ovens. ....and your personal computer on which you typed your ignorant comment, not to mention your cellphone and other technological advancements. I just cringe when I read comments such as yours, Mike. The space program has created spinoffs that touch YOUR pathetic little life EVERY SINGLE DAY without you even knowing it. Add to that fact, that this mission alone has gainfully employed roughly 7000 AMERICANS, who then took their hard-earned money and put it back INTO the system, buying goods and services for their families, IMPROVING the economy rather than DESTROYING it. You, Mike, have no idea what you are talking about. Wow - seriously? Why are we reporting on a "wiggling wheel"? Why is it taking so darned long for the rover to begin moving? This is insane - get the rover moving NOW, or stop reporting on it. Grow up. You sound like a two year old. For some idea of how difficult this is, imagine a dust mite throwing a fleck of dust from one moving basketball in L.A. to another moving basketball in N.Y., aiming for the center of just one of those little 'nubs' on the ball, and missing by less than 1/100th of a millimeter. That's all we're saying. Go. Get going already! You forgot to mention how many jobs it created – how many people will still be employed and for how long. "telling the six-whelled rover "
Really? A science article that can't be proofread or edited for simple spelling? Nice catch! It's been corrected. Extending my sampling arm... extending... extending - Ahhh! Man, that felt good. Now wigglin' my wheels, feeeeeeelin' the burn... done! I am so ready to hit the trail to scoop up dirt, and maybe pop a couple of wheelies when NASA's not looking! hehe, thanks for making my morning. That comic is pretty clever. Thanks for the laugh. Sometimes I think this whole process is very slow. My friend calls it "Job Security". I believe NASA do things very slow so they can stretch a project for years. What do they do the whole day? Drink coffee. They should be moving from the first day it landed. Something wierd on the way they work. Think of the rovers the Apollo astronauts drove around on the moon forty years ago. The had to unpack them, unfold them, and drive them around at up to 8 mph (compared to the Mars rover's .05 mph) and collect hundreds of pounds of rocks, all in under 3 days. They had the right stuff in those days! They had the right stuff then, yup. You know what else they had? Thumbs. And immediate response times. And an immensely more complicated self-diagnostic system (nervous system). Call me when you launch a remote control car out of a cannon and have it land in (almost) perfect working order. You don't need thumbs to go zero miles an hour, Vesstair. Or a brain. I feel your impatience but stop and think. They are testing the rover on a place that takes 7 minutes for a radio signal/command to reach, 14 minute round trip. This is a 2 billion dollar asset and if something goes wrong it cannot be sent back to the manuf for repair. I am sure there is a lot of coffee being drunk but its not to keep from falling asleep. It can take me days to test properly computer code that took me only 2 hours to write. Yep, its slow, drives me nuts too. But it is careful and deliberate with every move (or not) with a purpose. And I am also fairly certain the scientists are as impatient as you. No astronauts around to fix things and wander around picking up rocks this time. < 5.5 Minutes by my math, based on the current mars opposition. (61,000/(186*60)) But OK... I'll give it to you. And you arrived at this conclusion through your engineering degree and how many years in the space sciences? That's pretty much what any two-year-old with an instant gratification issue would think. If you had a plutonium powered rover that could average just one mile an hour, you could go all the way around Mars in less than two years. You could see the sights! Unfortunately, this one can only make .05 miles an hour (tops), and its average speed to date has been zero. Please calculate the energy required to move 1 ton 1mph on mars. For ease you may assume level flat ground, and a coefficient of friction of .4. Thought so. A basic problem with this rover is they only have .1 hp (at most) available for moving around. And that's with a plutonium source that, if they had used it to run a stirling cycle engine, could have gotten them around a lot faster. In fact they looked at that, but perhaps they decided if they saw too much of Mars with one rover, they wouldn't get to send another one. Anyone who has worked in big companies with government contracts is familiar with this. Your reward for a job well done may be unemployment. Billiam, is that 1 ton on earth or 1 ton on mars? For simplicity, let's go with ~900 KG. Assuming .4 CKF, it would require 360 N of force to propel this cute little guy on the surface of Mars. I am not quite sure what you mean by "energy required to move 1 ton 1mph" ... this would require an energy flow rate, such as Watts, so saying it would require "energy" is nonsensical unless a distance is specified. Assuming 1 MPH, it would require ~161 watts to move this heavy little guy, or about .21 HP. According to JCDavis the rover only has .1 HP available however, so it would seem it could not achieve this feat. Either way, to move a mile at this speed would require about 139 human calories (Kcals). So how many watts are required for 340kg (Mars' gravity is 38% of Earth's) and an actual top speed of .09 mph ? This is science at its best! Go Curiosity! I can't believe we are doing with with children starving and old people being denied medical care. I am ashamed to be an American. When we re-elect Obama he can start cleaning house and end this sort of wasteful spending! You're insane to think that spending every cent of available money would stop people from starving and old people from suffering. If we don't advance the boundaries of space and technology as a species we are doomed to a far worse fate than what you witness in this day and age. NASA projects have made so many discoveries that help starving children it's amazing, space exploration tech will help eventually feed the world. And Obama is President and this is happening now, he will only increase NASA spending in the future hopefully. Then we must vote Obama out. The Curiosity mission cost 2.5 billion. The 2012 Olympics cost 15 billion. The two wars in Iraq and Afghanistan have cost 1.3 trillion since they began. That is much more of a waste than expanding science. There are hungry and the poor. They shall ALWAYS be with us, Humanity and it's need to explore, to discover and to learn about the Universe is a noble thing. If you want to feed the poor, that too is a noble thing. Why not take the money from the Defense Budget? The Mars Rover cost $2.6 billion dollars – a big BIG chunk of NASA's budget. In return, we have a presence on ANOTHER PLANET! $2.6B to the Department of Defense would buy what,.. less than half of one of their latest aircraft carriers? I would expect that WHOEVER is in the White House to do their best to feed the poor but not at the expense of discovering new frontiers. Being a liberal myself makes me ashamed that you use the name "LibsRule." It was another liberal champion (JFK) who really pushed our space program. Liberal thinking has always been about enjoying the other things in life besides having more money such as knowledge and discovery. The NASA budget is miniscule compared to other expenditures of our government. Obama is for Mars exploration. This is an exciting time. Go Rover. You are just a troll trying to turn liberal space lovers against Obama. Won't work. You are transparent. It's been there 2 weeks and we're just now preparing to wiggle the tires. Maybe next week, we can roll it forward 1 inch. Clearly a government project. Clearly, a post by someone with the patience of a two year old. Clearly a multi-billion dollar investment that rappelled to another planet from a jet pack. Testing everything is prudent. It would be a shame if the rover died after three weeks without ever going anywhere. You're right, lets just let it loose. Besides if it crashes or malfunctions and $2.5B are lost, I'm sure you'll be the first to complain. Troll. I bet you broke all your toys when you were a kid. I'm just wondering though, how is this anything like a learner's permit? It might ignore the instructions from NASA (its "parents"), and go tooling about Mars at high-speeds (> 2 MPH!). Many young people who read this story will come away not knowing the difference between "its" and "it's." keep it up. All we learn from out there helps us here. And who knows, maybe we'll find out we're not alone. I think we should go further than the moon and maintain ISS as well as our satellites that are in orbit. I'm aware that the several billion dollars spent on Curiosity has created alot of high paying, short term jobs. Those funds could be better invested in alternative energy and recharging our underground aquifers for fresh water. Too bad we couldn't run all vehicles on nuclear energy like submarines do. THis mission cost you about $1 per year over the lalst 8 years. How much infrastructure repair would that buy. It is like some guy buys a soda for $1 and you ask if the money would have been better spent buying a house. In both cases it is not either/or we can do both. Uh – most of those jobs spanned the last decade – hardly short term. And they provided training for subsequent employment impossible to obtain anywhere else. I think you should ram your head back in the dark, warm place it came from. Nice catchphrases "alternative energy" and "recharge our underground aquifers" You could be a politician. How do you propose we use money to "recharge our underground aquifers" buy water from China and pump it into the ground? This thing's amazing! Best wishes for Curiosity! Let's ban Plutonium flights over the heads of our children. No excuse for this stupidity. NASA has already proven that it is uniquely capable of rocket disasters…do we need a plutonium release to shut this down? Plutonium is incredibly dense and strong enough such that it would not really be an issue unless the reactor itself landed on you. Further launches do not go over any populated areas – the launching site in FL is such that the rocket goes out over the ocean when it launches. Totally worth the risk. If you're more comfortable wrapped up in your blanky with your thumb firmly rammed in your mouth, feel free to remain there while the rest of us accomplish something. But it didn't. Thankfully we have the crack experts at Fukushima to handle our Earthly radiation needs. Or 3500 middle class jobs. Just push the throttle forward and go! These people take weeks to collectively decided to make the thing drive ten feet. Then they'll break out the bubbly....Come on for Christ's sake, put the hammer down and drive. It ain't like its on the edge of a sheer cliff and is in danger of falling off. Nick, you suffer from a common malady known as "instant gratification syndrome". You want results NOW and there are no results NOW to be had. It's a good thing that NASA scientists have a lot more patience than you do. Besides the possible hazards that lie in front of Curiosity, the rover is in a completely different place than the previous rovers. There are new things to look at and explore. Just how much are YOU going to complain when Curiostiy takes the better part of a YEAR just to reach the base of Mount Sharp before it starts its historic climb up the mountain? Could you imagine driving your car by email? every 20 minutes you check the camera photos then email an instruction to move the steering wheel a little. To think about it another way: There is a 26 minute "lag" can the controls and it takes hours to get photos. Mar is a LONG ways away. You are wrong, they have been using subspace to communicate from Earth to Space for quite some time. It takes milliseconds, not "13 minutes" as you say. You need to recognize! And once they have the matter transport beam out of prototype and into production, we'll be able to send supplies via matter stream. I saw a recent demo and it worked perfectly! Not to be negative, but I would like to hear what Nasa thinks about the terrain at this current location. It looks like desert pavement similar to what Spirit landed on. Not really the terrain expected if this is a layered deposit on the bottom of a lake bed. They're at the bottom of the crater, so most of what's around them is uniform having been blown in by the wind. When they move to the crater edge, they hope to be able to see, and easily access, multiple layers. The angled surface of the craters edge would be much harder to land on. They landed a couple of miles from a mountain that has the layers they wish to see. They are right where they need to be. They landed on what is considered to be an alluvial fan – rocks eroded from the crater walls and deposited by streams. That's why the first real science target is about 400 m to the east where some of this has been exposed by later erosion. Then in November or December they will turn around and head back toward Mt. Sharp where the layers and minerals detected from orbit are located. They landed outside a crater which exposes sedimentary layering. The intent is to explore it. Landing in it is too high risk; the terrain is much more rugged than that at the landing site. No, they really did land inside of Gale crater. Congress costs $30 million a day. They are doing far less than Curiosity. You don't need to spend that much to explore your own dirt. Go out into your own backyard, dig a hole, put your head in the sand, and study it. The rest of us prefer to keep our heads out of the sand and explore the universe. It's not like we sent a pallet of 2.6B in small bills to Mars – it WAS all spent here. Exactly, but some people are just too dumb to realize that. At least for now, we don't buy Mars rovers built in China. But it could have been much better spent on Congressional hair cuts. Akin's coiffure is looking a little ragged today. too expensive, too hard, too challenging, shut up! Go live under a rock. Hey Rover, put the cell phone down, no drinking, and take it slowly. What about the results from the rock? Maybe tomorrow, a press conference is scheduled for NASA TV tomorrow at 2:300 EDT. In the meantime, it was stated on today's press telecon that it looks like a typical Mars basalt. The rumor is that after zapping the rock, it started bleeding. And that in modern times (i.e., now) the RTGs are designed to survive reentry intact. Nuclear power has been used in 26 previous space missions over the past 50 years. This particular mission posed no real threat, and there was never any danger of it exploding. They didnt load a nuclear bomb into the thing! The chances of them causing an issue on Earth, while possible, is miniscule. You are subscribing to Karl Grossman's panicked ravings about nuclear power. It's not like they are using naquadria or anything. Jeez. Only a few kilos of plutonium. I sprinkle plutonium on my cornflakes every morning. Nasa needs to figure out how to build a naquadah generator and ZPMs. Power the rover for a thousand years. Seriously though. The Russians build tough RTGs. They can survive reentry intact. There's not enough plutonium to reach critical mass even if it were reprocessed into the required grade – not even close. It just sits there slowly making heat. It's the final phase of a plot by G.W. Bush, Carl Rove and Rush Limbaugh to hide radioactive material off-planet for later use in attacks on orphanages and small animal farms. Uh, you should be more concerned about loose nukes and nuclear waste right here on earth. As said above, the RTGs are relatively safe. You sad: "This particular "Curiosity" is a Crime: "...in radioactivity, the 10.6 pounds of Plutonium-238 being used on Curiosity is the equivalent of 2,862 pounds of Plutonium-239." Can you want to put that into science, or English? Because what you have written makes no sense in either. Pu-239 is fissile, and is what bombs are made of. The material in RTG's is primarily Pu-238, which is non-fissile (cannot explode), and is an alpha emitter. Alpha particles are Helium nuclei, and are pretty safe-they cannot penetrate a couple pieces of copy paper. But most importantly, last time anyone checked, there is no one on Mars to become contaminated. smdahl – and I bet you with your small mind begrudge every every cent that is spent by NASA. You happy that the USA has to hitch a ride with the Russians to get to the space shuttle? smdahl, please, please take an introductory physics or chemistry course. You guys do realize that trolls do this just to get your kind of reactions. Certainly. But usually trolls try more to push your buttons without remorse and create emotional lines of attack. This one seemed to be simply based off ignorance of the nuclear device itself. smdahl: You should do proper research and learn the truth about how nuclear energy is used for these sorts of missions. You'd probably learn a thing or two and reduce your level of ignorance significantly. You don't need to be an expert on the issue. I'm a complete layman myself. But this is very different from nuclear energy that is released in a bomb, as well as different from that of nuclear power plants. The slow rate of decay generates enough energy for this amazing rover to bring us what will sure to be many important discoveries. The size of the vechicle is large than any other ever attempted.. And because of sheer size, nuclear was perhaps the only way to go about it. Awesome, this can hopefully get interesting. Queue people whining over the cost that kept hundreds of people employed. To build this, and the rockets employed a lot of people in high paying jobs. These jobs are not the good walmart jobs that everyone is looking for. Shane, in reality, the Curiosity mission has/is employing over 7000 Americans. 7000 welfare jobs paid by the tax payer. So.... People are lining up to whine?